Donald Trump and Kim Jong Un will meet for the first time in a few weeks. The US president hasn’t insulted Kim on Twitter in nine weeks, as North Korea has ratcheted down its nuclear activity and held talks with South Korea. It shows how rhetoric between the two nations has cooled significantly. Donald Trump and Kim Jong Un will meet face-to-face for the first time this year, in what will be a historic moment. But the encounter, set to take place before May, hasn’t been a bolt from the blue. The US president has significantly toned down his fiery rhetoric against North Korea in 2018. Kim’s regime, meanwhile, has slowed down nuclear development, halted missile tests, and engaged with South Korea during the Winter Olympics. One of the easiest places to see the changing dynamic between Trump and Kim is the US president’s Twitter feed. Once the front-line for America’s anti-North Korea rhetoric, Trump has been notably quiet on the issue in recent months. 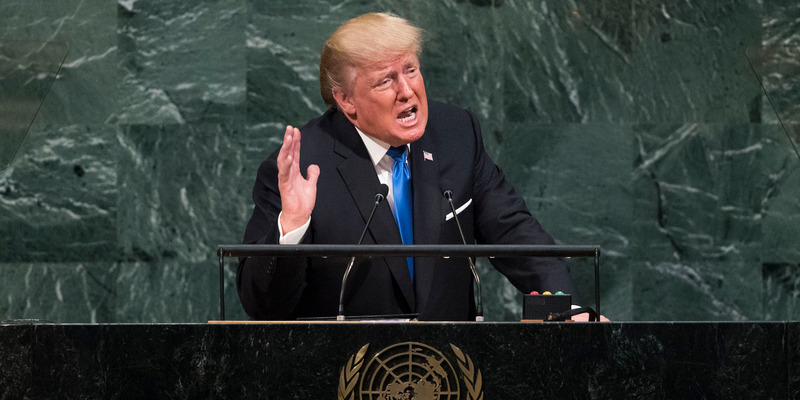 Drew Angerer/Getty ImagesTrump at his UN speech, where he referred to Kim as ‘rocket man’ in front of hundreds of diplomats. Around this time, North Korea launched three intercontinental ballistic missiles (ICBM), one short-range missile, and one nuclear test. Two days after the country flew a missile over Japan, Trump called Kim “rocket man” for the first time. Trump proceeded to use that nickname at least six times after that – once in a speech to the UN General Assembly on September 19, and five more times on Twitter. Kim responded by calling Trump a “mentally deranged US dotard,” and North Korea’s foreign minister said he considered Trump’s tweets a declaration of war. Since then, however, Trump’s fiery rhetoric has cooled significantly. He mentioned “rocket man” once more on January 2, while doubting North Korea’s attempts to communicate with the South, but this was the last such reference. Since then, the president has not insulted Kim or his regime once. Also in January, North and South Korea held their highest-level talks in years, where they agreed to work toward peace. Two days later, Trump told The Wall Street Journal he would “probably have a very good relationship with Kim Jong Un” – a significant departure from previous sabre-rattling. In February, Ivanka visited South Korea for the Winter Olympics.The country’s officials welcomed her with extraordinary pomp and circumstance, reportedly in hopes that she would persuade Trump to visit Pyongyang. Marianna Massey/GettyIvanka Trump at the Pyeongchang Winter Olympics in February. After the Winter Games, North and South Korea met face-to-face, Kim promised to give up his nuclear weapons, and said he wanted to meet Trump. Trump praised the “serious effort” being made. Whether the Trump-Kim meeting will lead to denuclearization or sanctions relief is unclear at this point. While Trump has been praised for leading a diplomatic coup, critics also caution that Kim may be entering meetings just to gain sanctions relief, only to back out at the last minute. Whichever way the talks go, you can bet the US president will be tweeting about it.